This entire article was written thanks to the extensive work done by Jessica Boulanger, COETAIL graduate and IB English teacher, who prepared and presented a very comprehensive workshop on technology integration with SAMR. You can find her presentation at the end of this article. “If you’re a good math student, you don’t need a calculator.” Some of Linda Kuiken’s new students come from their previous schools with the notion that the best students should be able to perform without a calculator. Linda, an experienced AP and IB math teacher, is quick to point out exactly the opposite: in fact, a calculator facilitates the understanding of mathematics. Refusing to use it puts you at a disadvantage. Of course mental calculation preserves its relevance but performing complicated operations such as calculating standard deviations only by hand is no longer seen as a proof of mathematical mastery. When the calculator replaced the slide rule, it enabled a shift of focus from processes onto critical analysis of results. It released operational time which could be used for higher level tasks of analysis and evaluation. Similarly, a successful integration of technology in the classroom improves your students’ learning experience. However, this does not get accomplished by simply introducing technology into the classroom. To achieve this goal, it is necessary to comprehend the technology environment in which the learning takes place and to evaluate how you are using technology to enhance or -better yet- to transform the learning experience. 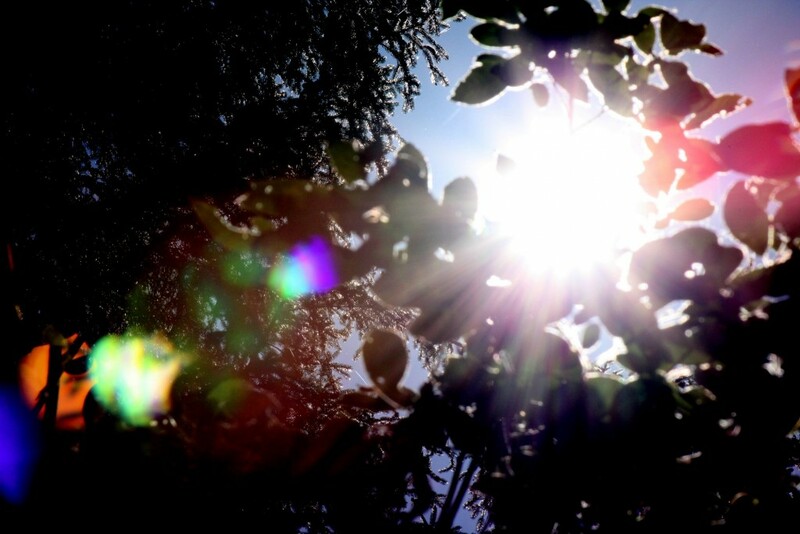 In her prescient article It’s Not Just a Tool: Technology as Environment, Kim Cofino points out: “we look at technology as a tool, but our students look at it as an environment”. A tool is something used sometimes and only as necessary if it suits me, something I control, something small that I can manipulate. An environment is something present around us all the time, something beyond our control, something necessary and ubiquitous. This difference in perception between teachers and students is the single most convincing argument for why we have to teach differently with technology. Basic low-level tasks demonstrating a simple understanding from your students are no longer a relevant learning experience. Worse, the shortcuts that technology offers may even replace the comprehension you were expecting from the task. My social studies teacher in middle school had us painstakingly reproduce the notes she would write on the board in the hopes that it would anchor this knowledge into our brains. Today’s teenager would quickly snap one photo of the board with her smartphone and promptly share it with all her classmates, bypassing the original intent of my teacher. Integrating technology authentically means redefining the task we assign to our students so they can demonstrate higher order thinking skills such as analyzing, critical thinking and collaboration. 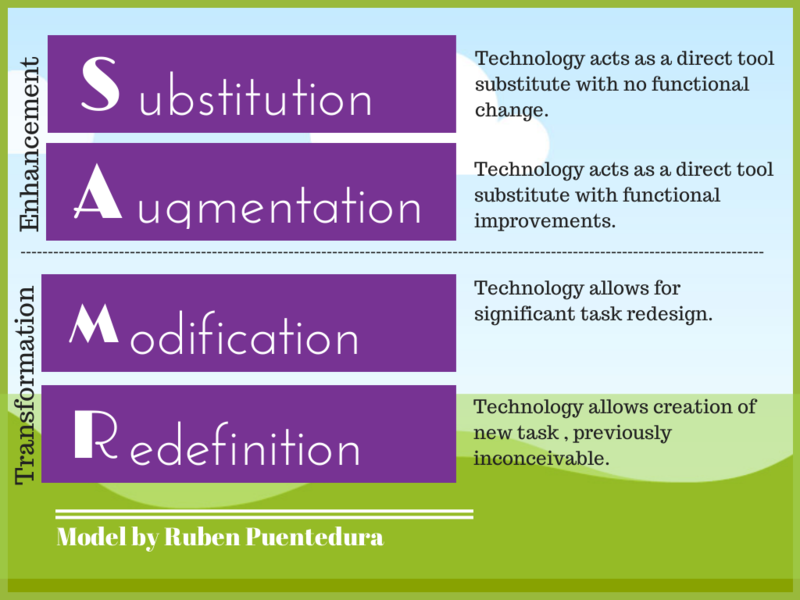 The best guidance on the path of technology integration comes from a model developed by Dr. Ruben Puentedura and identified by its acronym SAMR: Substitution, Augmentation, Modification, Redefinition. The SAMR Model of Technology Integration – Graphics credit Laura Pasquini via Flickr CC BY-NC-SA 2.0. As represented in this graphic, the SAMR model of technology integration offers a visual scale measuring the impact of technology on a task. At the most basic level, substitution, technology simply replaces an existing tool which was already present in your instruction. At the highest level, the task is completely redefined by the use of technology, allowing for previously inconceivable goals. Our objective is to move from simply enhancing learning to transforming learning with technology. This summative video from Common Sense Media clearly explains the key concepts behind SAMR: introduction to the SAMR model. SAMR is a very nice lens through which you can evaluate what you are already doing in your classroom and perhaps enhance existing assignments. The teachers in Jessica’s workshop defined successful technology integration by its ability to add value to the learning experience. Specifically, our very own grade 5 teacher Gene Chagaris sees radically positive results when her students know the end task and can use the technology naturally, by themselves, to get there. As a teacher, she can step back and provide feedback as they negotiate their personal paths towards the determined goal. In doing so, students use technology on their own to learn inside and outside of the classroom. Students learn independently while blending multiple skills. All the teachers agreed that students learn best not when they are taught at, but when they are producing. To arrive at an authentic product from the student should, in conclusion, be the ultimate goal of an assignment in our schools today. The question is no longer if technology has a place in your classroom but how do you successfully integrate technology. This is the presentation created by Jessica for her workshop on using the SAMR model of technology integration.